ATLANTA - November 28, 2018 - ARAUCO announced today that proprietary, InCopper® antimicrobial technology has been accepted by the Environmental Protection Agency (EPA) Antimicrobial Division for registration under the Federal Insecticide, Fungicide and Rodenticide Act (FIFRA) section 3(c)(5); with EPA Registration Number 93650-1. 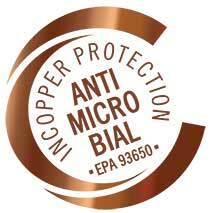 Beginning in January 2019, InCopper technology will be used as a standard surface protection in ARAUCO's exclusive Prism TFL designs. "Achieving EPA registration for InCopper technology is an important milestone as we continue to offer practical enhancements for Prism TFL," said Kevin Shotbolt, Vice President of Sales and Marketing. "Prism TFL is the only laminate in North America with the safe and proven-effective antimicrobial performance of a copper-based agent," he continued. "InCopper actively protects the surface of the thermally fused laminate (TFL) panel from stain and odor-causing bacteria, fungi, parasites, mold and viruses." "We are delighted that Prism TFL designs enhanced with this safe and affordable antimicrobial technology will provide a competitive advantage to our customers working with Prism panels," said John Verzino, National Sales Manager - TFL. "There are other decorative laminates that make antimicrobial claims, but they are not EPA registered, may not be permanent, or may not use antimicrobial agents that are as environmentally-friendly as InCopper technology." Prism TFL with InCopper technology is ideal for specified projects, industrial use and fabrication for healthcare, hospitality, retail and multi-family applications. It is especially useful in areas with high traffic flow or exposure to humidity, such as hospitals, restaurants, office/workplace, kitchens, bathrooms or closets; where the panel may be susceptible to contamination by microbes or mold. Independent laboratory tests using the ISO 22196 methodology showed that 99% of bacteria are effectively eliminated from the surface of Prism TFL panels with InCopper technology.